Thinking lately about centering blanks: finding their exact center and drilling there. And whether it is actually unnecessary and possibly counter-productive. Choosing my spot, rather than measuring it, lets me select grain patterns that are likely to be more interesting. Also, if there's a possible flaw in the blank that could lead to cracking, etc., I can avoid it. And even if I do want the blank to be centered, I don't think I'm off by more than a mm or so doing it by eye, vs. trying to actually measure it. In turning, it all evens out anyway. Almost exclusively, I am using blanks from wood that I claim and reuse for the purpose, rather than buying blanks. I tend to cut them to about an inch on a side, if I can, so I have a little more wiggle room than you'd have on a typical 3/4 inch bought blank. Is there some benefit to using the measured center that I'm missing? My pens don't seem worse or more fragile as a result of my doing this. It saves a little time and I think gives me more control, not centering them. Not necessary unless you are doing any sort of segmenting, where you want your finished product to be symmetrical. Take a look at the displayed pen on page one and try to imagine what it would look like if the drilled holes had not been centered. IMHO, no, others may have a differing opinion. If the hole is centered, there is less wobble when starting to round the blank. The turning of the blank, of course, makes it round to the hole. As a note, on two barreled pens, centering the hole might make it easier to align the grain pattern across the center band. Careful drilling off center on both blanks will achieve the same results. And besides, some of the blanks that you will receive won't be square to start with. They can be rectangular on the end, or curved along the length. You should look at the context of the "centering" discussions. John - BURLMAN, hit it. For simple blanks, it does not matter. But in segmented and in some cases solid cast blanks, it does matter. even .1mm off center would have thrown the segment spacings off. DAMHIKT. I agree with BURLMAN's comment about the segmenting type blanks, your idea and justification that is not necessary to measure and drill the wood blanks at its exact centre is quite correct ONLY IF, you can drill straight. Blank dimensions may have something to do with drilling accuracy, is most cases people prefer fatter blanks rather than skinny, the less accurate your drilling is, the more important is to have extra wood around the hole centre, there is off-course the issue of the different types and sizes of kits, their tubes and bushings OD's. Interestingly, and from experience, drilling pen blanks dead straight is not as easy or "repeatable" as some may believe/assume. Various drilling methods and equipment have been used, some folks don't seem to have any issues while others just can't get it right regardless of what they use, I don't want to get into the why's do's and don'ts, that is not the point of my comments I do however believe, the way the piece of wood is drilled will result in multiple results, grain wise. Not an expert by a long shot but grain patterns can change as you turn a piece of wood. I have found this in several species of wood. Same with synthetic materials- what you find after turning can be totally different from what you started with. I drill on a DP and machinist's vise. I use a center-finder and mark all four sides rather than two sides to get an exact center. Not all blanks are perfectly square. Even drilling on the lathe isn't always fool-proof, especially with wood blanks. I just find the rough center of the blank, chuck it up and center-drill it first. Even doing that, the bit will sometimes follow the grain instead of going straight (especially with smaller bits). Probably the trickiest drilling I've done was drilling some Ebony piano keys--quite a challenge, even with a 7mm hole. Plastics usually drill pretty straight after starting the hole with a center drill (a set is around $10.00 on Amazon, and well worth having). My bottom line is that (with certain exceptions as others have mentioned) if the material on both ends of the drilled blank exceeds the bushing diameter at all, it's good to go. Location: Oklahoma City, OK, USA. Agree, I do the same thing on most blanks, just eyeball and go. Again, if a segmented blank where symmetry is needed, it's a different story. Been doing it your way for 12 years , but being cheap I usually cut larger stock to about 5/8 square . I often deliberately drill at an angle through the piece to optimize grain pattern . The most important thing in doing that is to have the piece ends as close as possible to being parallel planes perpendicular to the intended axis . Experience should be a pretty good teacher on reading grain , but some woods are prone to throwing surprises . I don`t do segmented blanks , but do some castings where drilling accuracy is important . I carefully mark the intended drill point on those , although that may not be in the center . Last edited by 1080Wayne; 12-20-2018 at 12:15 PM. 1. The hole is always centered around its own axis, and you must have enough 'meat' around the hole to allow for the thickness of the final material around the brass tube - including beads if your design calls for that degree of ornamentation. 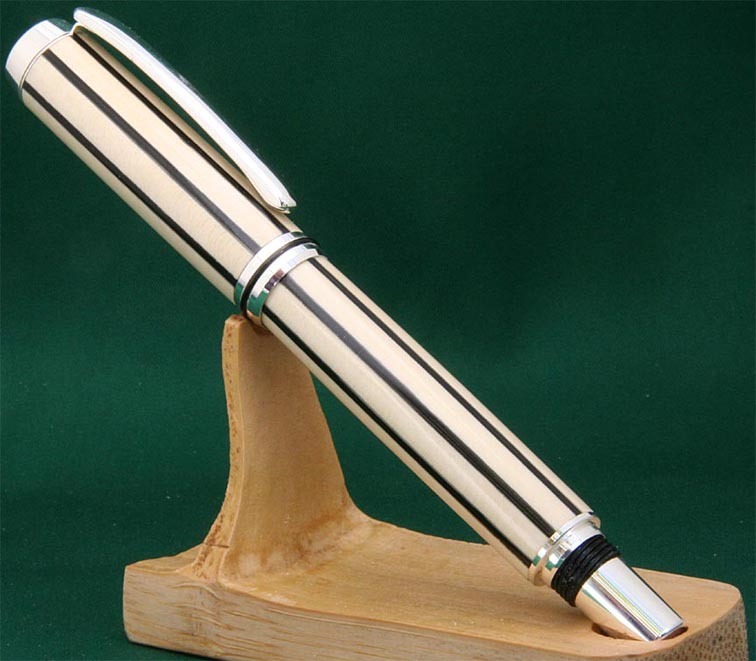 The bottom line is that you (usually) want the finished pen to be round - with no flat spots. 2. If you are working with a segmented blank, it is sometimes necessary that the hole be centered on the segmented pattern. For example,when doing 4-layer celtic knots, you must start with a square blank and drill exactly on center - otherwise the knot will be unbalanced. 3. Sometimes, the surface of a blank can be stained, either by age and weathering, or by exposure to 'stuff' lying around the shop. In that case, the hole must be drilled leaving enough margin final thickness of the pen plus a thin layer that you will turn or sand away to expose fresh timber.